Today was such a dark, misty, rainy day here. You would never know that summer officially only a few days away. Hell, it was only 11 degrees Celsius all day at my house! Even though I don’t like super hot weather and don’t tan worth a damn, I would like to see some sun before I’m back in classes! There were alot of new food items that made their way into my day. Totally unintentional, but makes it just that much more fun to blog! 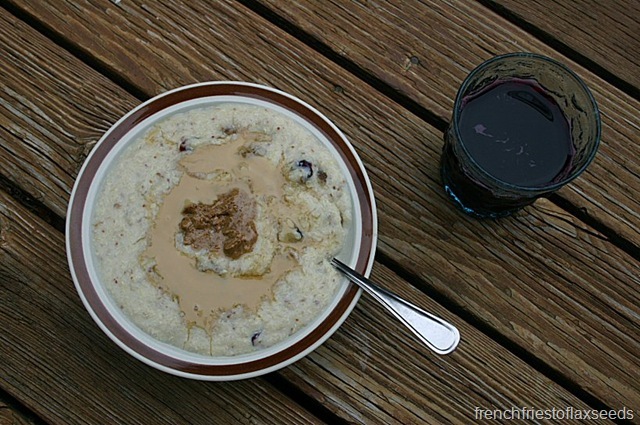 That may look like a regular ol’ bowl of oats, but it’s not. I picked up some quinoa flakes the other day (on sale at my store – who knew we even carried them? 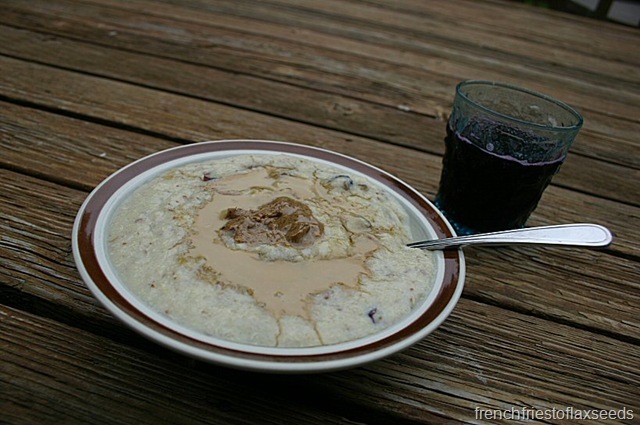 ), and decided they would make a great breakfast on a cold rainy June day. 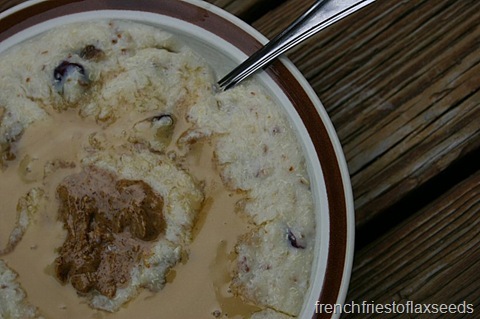 But as they cooked, they didn’t seem like they had enough liquid, so I ended up adding a bit more milk. Maybe 1/4 of a cup? I’m not really sure. 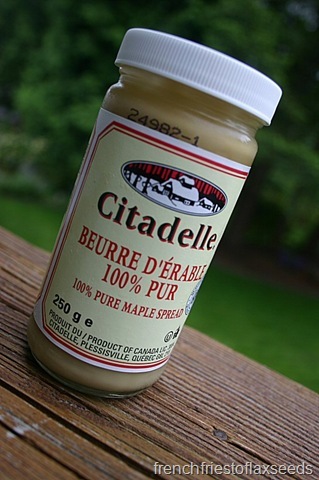 Mom was reorganizing the cupboards, and found this jar of maple spread. Her reaction – “Marianne will use it up on something”. Does she know me or what? 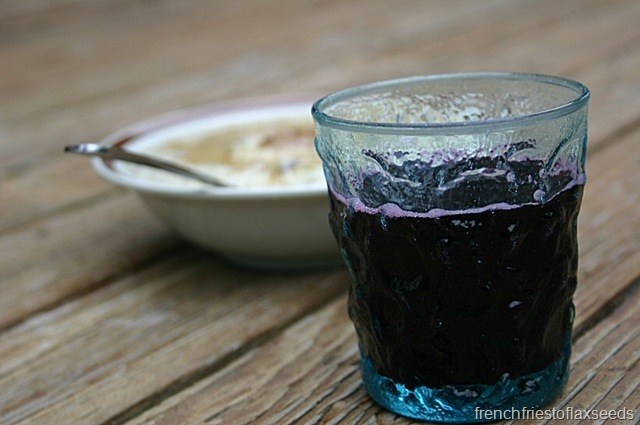 There was also a glass of pomegranate berry juice. Can you tell how dark it was out by the photos? Seriously…it’s June! All that gloomy rain made me want to stay in my pajamas as long as possible, and so I did, wasting as much time as possible reading blogs, answering emails, and putting together a new giveaway for you. By the time that was said and done, it was time to make lunch. Soup probably would have been a more logical choice on this cold day, but I was on a mission to use up my leftover chicken from dinner out at Refuel, and salad seemed like the way to go. Especially since I’d just bought some new salad dressing. 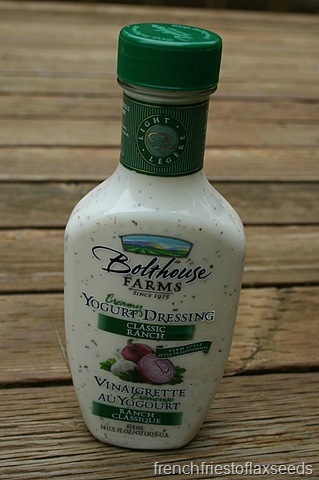 I’d been craving some ranch dressing, and picked up this Bolthouse Farms Yogurt Classic Ranch. 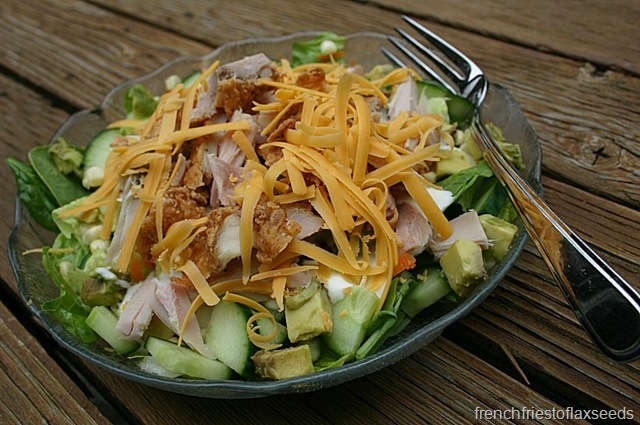 Which was perfect for my fried chicken salad. 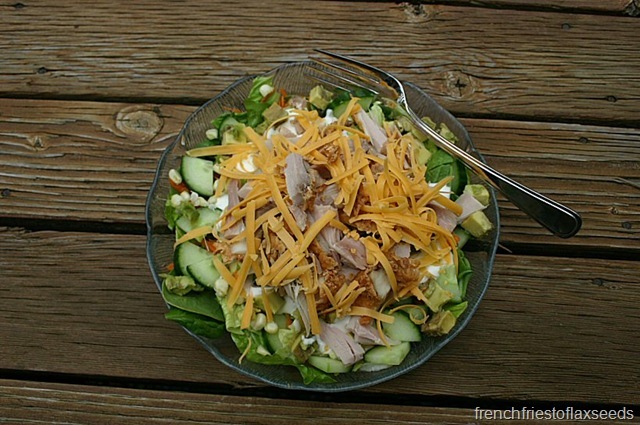 I layered a whole lot of stuff on that plate – baby spinach, romaine lettuce, grated carrot, cucumber, corn off the cob, avocado, ranch dressing, chicken, and cheddar cheese. 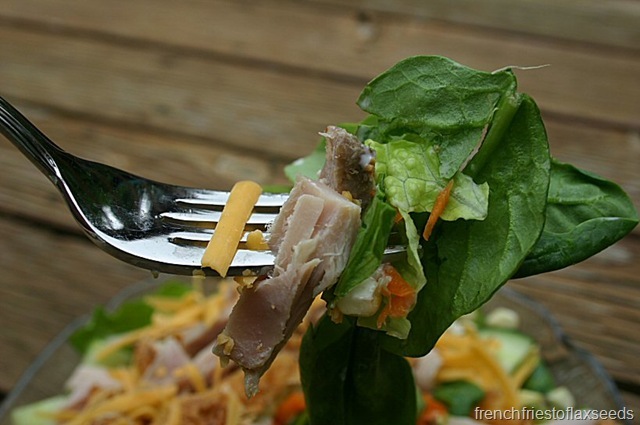 Repurposing leftovers at it’s finest. Sadly, my avocado tasted a little funky, so I had to pick out all the pieces. Otherwise, it was delicious and filling. I was getting a little stir crazy this afternoon, and spontaneously decided to take a trip down to the Port Coquitlam Farmers’ Market. I’ve been missing out on my local market, as it seems like I’m always working when its on. So despite the rain, I grabbed my jacket and reusable shopping bag, and headed out. Good thing I did too – there were some great finds! Spelt bread from A Bread Affair. 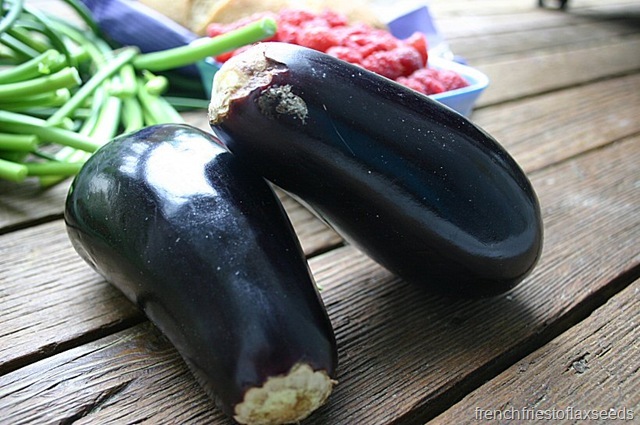 Locally grown baby eggplants – only $0.79 each. I’m kinda wishing I’d bought a few more. Local BC raspberries! I was pretty excited to see these – I like them better than the local strawberries. 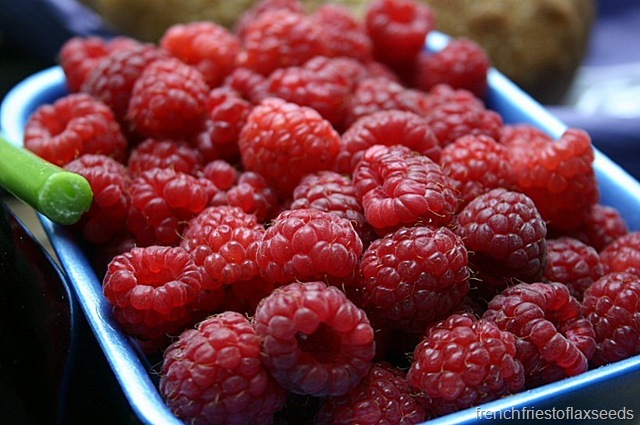 But even more exciting that the raspberries? 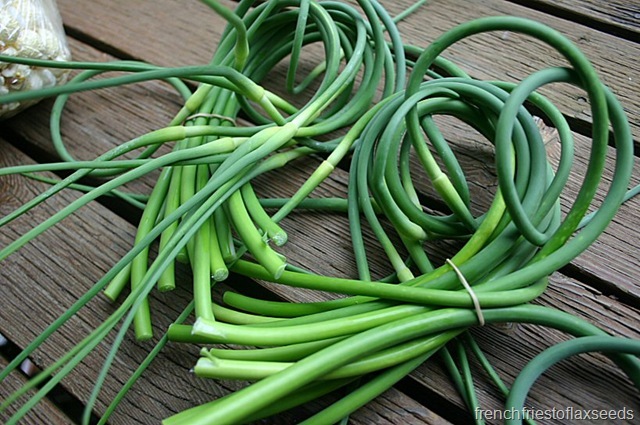 Garlic scapes! 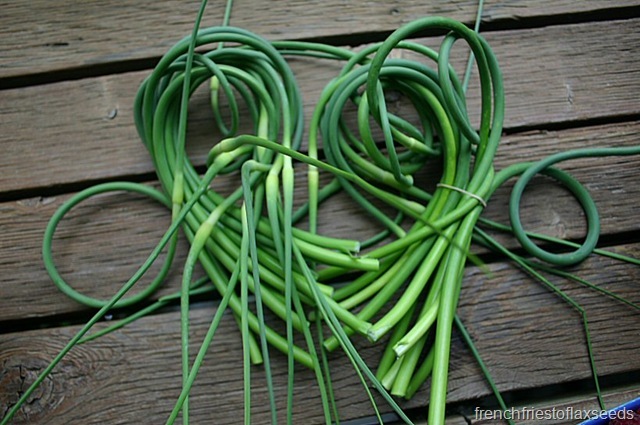 I have seen some scape-lovin’ tweets from Angela, and when I rounded the corner and saw Gusto Garlic’s booth piled high with these curly green treasures, I may have gotten a little giddy. I have plans for pesto with one bunch, and possibly risotto with some of the other? But I’m open to other suggestions. 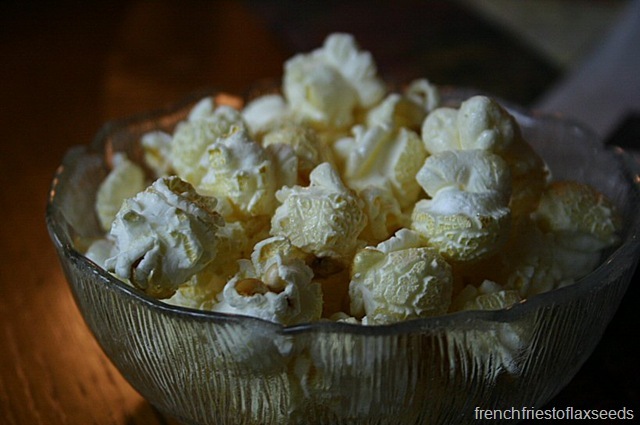 I also grabbed a small bag of kettle corn, because it just smelled so damn good. And made for a good after-market, pre-dinner snack. 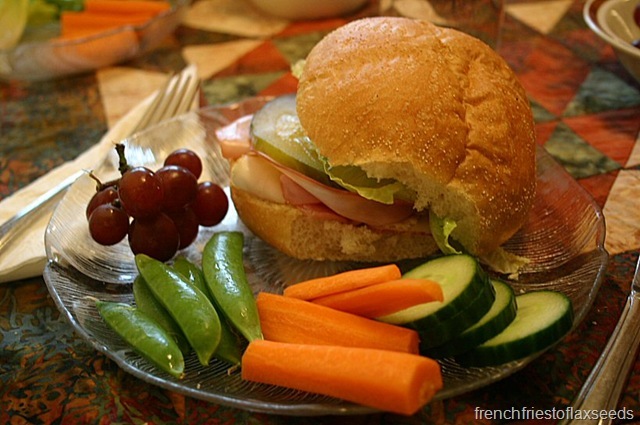 Speaking of dinner – we had deli. 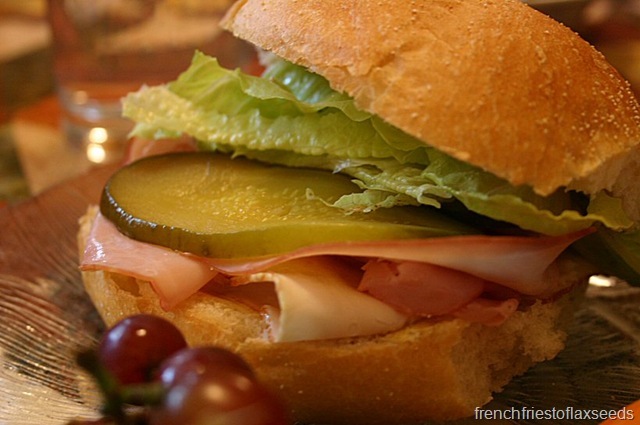 A kaiser piled with roast turkey, ham, sweet pickles, lettuce, dijon, and Little Qualicum Cheeseworks Fromage Frais. 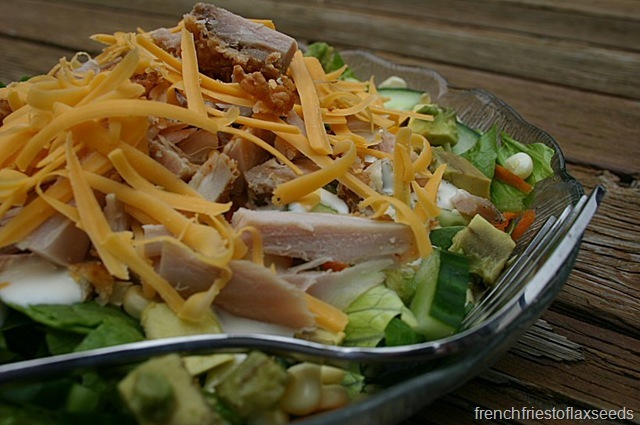 Plus some raw veggies and red grapes. 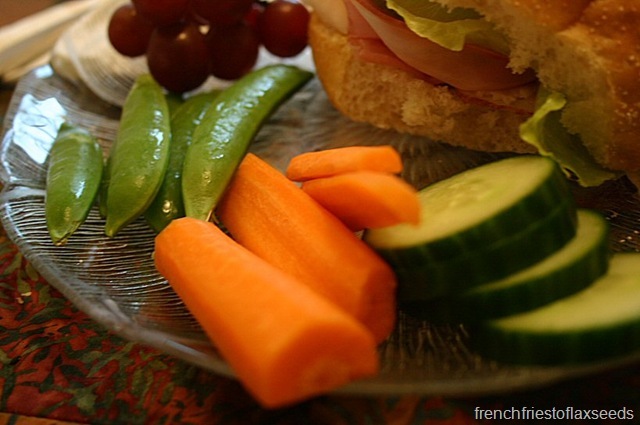 Mom would like me to point out that she had a hand in food styling my dinner plate. Thanks mom! A little while later, I was off to the gym for some sweaty good times. Once back home, it was time to break into that spelt bread. 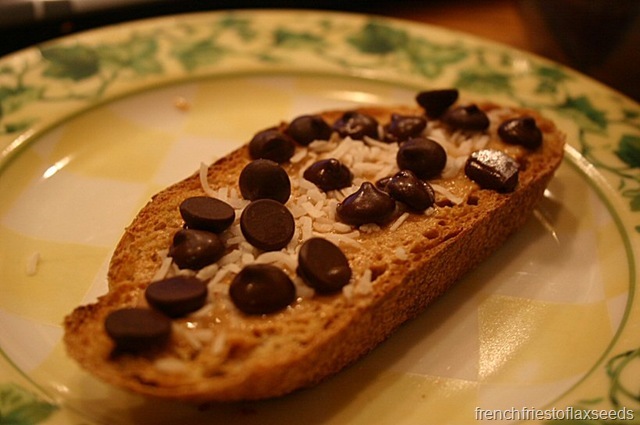 Toasted spelt bread + peanut butter + coconut + chocolate chips = dessert toast! 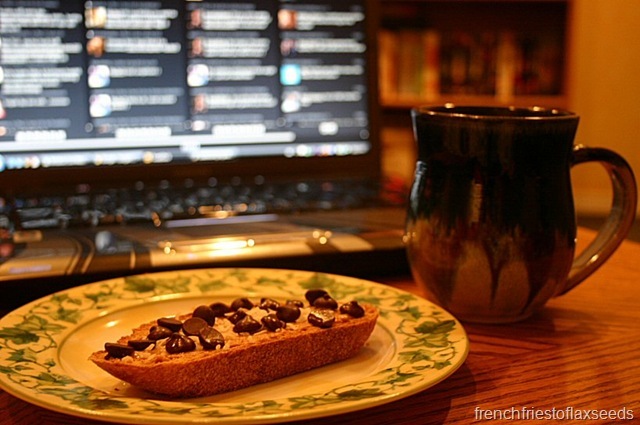 With a mug of coconut mango tea and a side of TweetDeck. Turns out my spelt bread is also a sourdough bread. 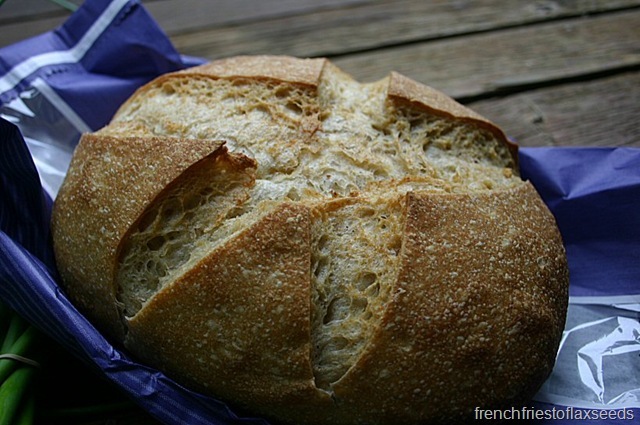 Even better – sourdough is one of my favourites. Me thinks I should try making my own. Does anyone have a recipe they can recommend? Alas, my 4 days free from work have come to an end. Tomorrow, I shall be back at the grind. 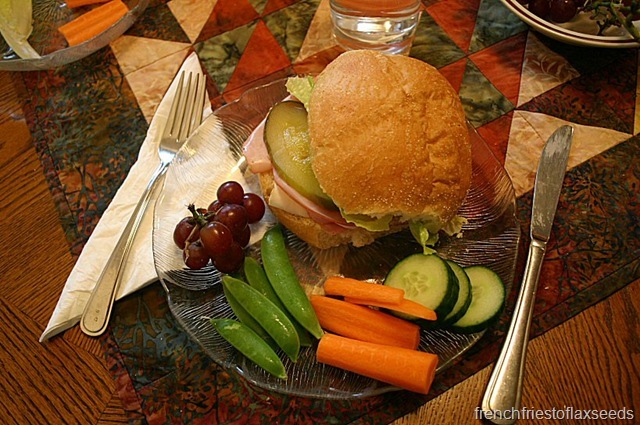 Oh well – good to earn some money, so I can keep myself in good eats, right? Signing off…Night! 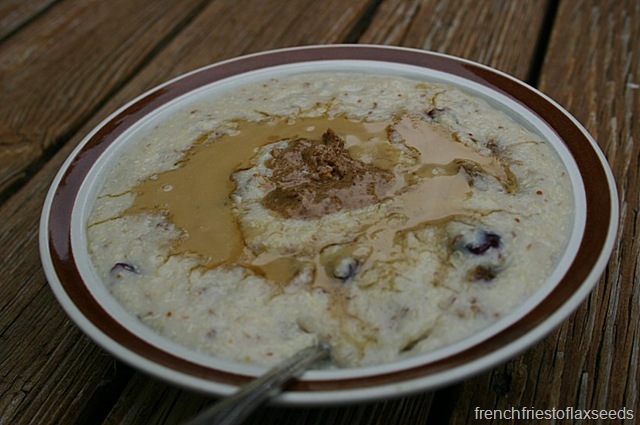 I’ll have Quinoa Flakes every so often, but still prefer the heartier texture of oats or oat bran.. that Almond Budder, however, sounds soo good! 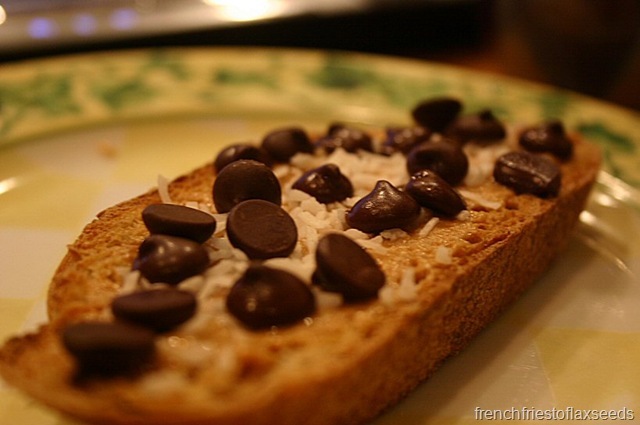 Chocolate chips + Coconut? Yesss. That sounds divine. I think I’m going to be picking up some coconut to go with my chocolate chips.. and whatever I decide to put them on. Great market finds!!! I’ve seen quinoa flakes before but have always passed them by. Maybe I need to rethink that…. 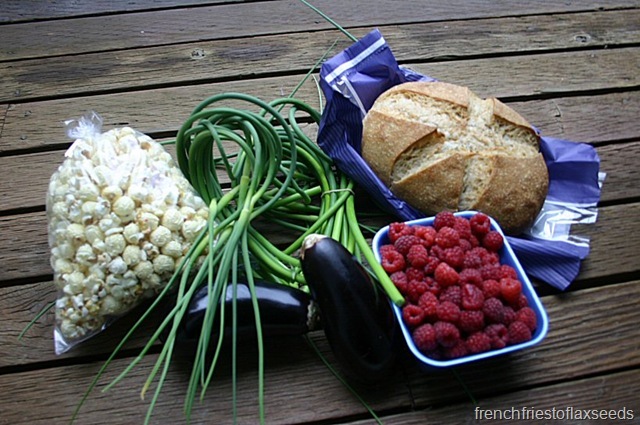 Beautiful produce–can’t wait to see what you make with that eggplant!